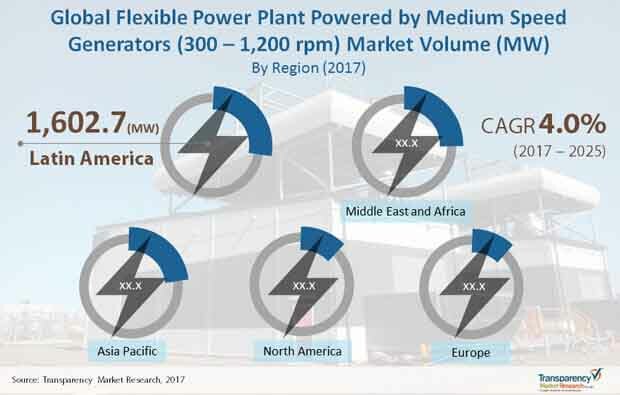 Key players in the flexible power plant powered by medium speed generators (300-1200 rpm) market include Wartsila Corporation, MAN Diesel & Turbo, Caterpillar, Cummins, Daihatsu Diesel Mfg. Co. Ltd., Kohler Co., GE Power, Rolls Royce, Doosan Engine, Kirloskar Oil Engines Ltd., Yanmar Co., Ltd., and Contour Global. The competitive landscape of the flexible power plant market is likely to remain fragmented in the coming years due to the prominent role played by small-scale regional players in the development of the market. Formulating region-specific pricing structures is likely to be vital for success in the flexible power plant powered by medium speed generators market in the coming years, making local players crucial to the market’s growth. According to Transparency Market Research (TMR), the global flexible power plants powered by medium speed generators (300-1200 rpm) market’s volume was 5,542.8 MW in 2016 and is projected to reach 7,901.5 MW by 2025 at a CAGR of 4.0% from 2017 to 2025. Asia Pacific led the global flexible power plants powered by medium-speed generators (300 rpm to 1200 rpm) market in 2016, followed by the Middle East and Africa. These developing economies are likely to retain dominant positions in the market in the coming years, with developed markets such as North America and Europe following due to the wider prevalence of reliable power distribution infrastructure in the latter. The growth of the flexible power plants powered by medium speed generators (300 rpm to 1200 rpm) market is a key part of the trend of the decreasing reliance on power generation from coal. The adverse environmental effects of coal-based power generation have become widely known across the world, which is leading to growing government as well as public support to alternatives to coal power plants. The heavy use of coal-based power generation technology in developing countries in Asia Pacific is thus crucial for the flexible power plant powered by medium speed generators market, as countries such as India and China are likely to require large-scale power infrastructure upgrades in the coming years. Other major market drivers for the global flexible power plant powered by medium speed generators (300-1200 rpm) market are the increase in the demand for power across the globe, growing prevalence of power outages, especially in developing countries, and the rise in the volume of off-grid power consumption. The rising demand for distributed generation and distributed energy resources may emerge as the most influential factor for the power generation industry in the coming years. The emergence of these technologies is affecting many facets along the stakeholder chain at the residential and enterprise levels, from customer engagement and capital expenditure to business opportunities aimed at taking advantage of wider adoption of distributed generation and renewables such as solar, wind, reciprocating engines, combined heat and power, fuel cells, and micro-turbines. Customers are increasingly becoming aware about controlling the usage of energy by pursuing cleaner energy options, cutting down on electric bills, or shoring up perceived deficiencies in the reliability of the grid network, such as during storms or natural disasters. This rise in awareness is driving utility leaders toward orienting their infrastructure development towards distributed generation.